The Reverend John Suddards had only been the vicar at St Mary's Church for six months when drifter Stephen Farrow stabbed him to death in his vicarage. The 59-year-old vicar had an open door policy and had previously spoken about Christianity sometimes involving taking risks. At Mr Suddards's funeral, the Venerable Geoffrey Sidaway, Archdeacon of Gloucester, said: "There's a lovely story that he used to light a lamp every night during his Ministry to signal to parishioners he was there for them if they needed him. "And we now know that made him very vulnerable." The body of Mr Suddards was discovered by a parishioner and two workmen on 14 February. Farrow has been found guilty of murdering both Mr Suddards and retired teacher Betty Yates, 77, from Bewdley in Worcestershire, following a trial at Bristol Crown Court. Mr Suddards joined the clergy 22 years ago following a serious car crash, having previously worked as a barrister. Paying tribute to Mr Suddards, his sister Hilary Bosworth said: "When John made the decision to become a priest, he told people that he felt he could help others more effectively as a priest than as a barrister. "This change of career was no surprise to me; John had always attended church and had a strong Christian faith. "Even as a little boy, he preferred castles and churches to sport or beaches and went to Sunday services more enthusiastically than the rest of the family." Mr Suddards's first posts as a clergyman were at St Nicolas Church in Witham, Essex, and Great Yeldham parish, also in Essex. Despite having only been in Thornbury a few months, the vicar had already made an impression on the community. Bruce Goodwin worked with Mr Suddards from the time he arrived at St Mary's Church in July 2011. The curate said: "He had a lovely way of reaching out to the poor and needy, to those who were perhaps the most vulnerable in society. "In some ways that legacy led to his death, but also will be part of what people remember about him. "He actually wanted to be known as someone who reached out to people who needed him, and would give a cup of tea or bowl of soup to anyone who came to his door." Mr Goodwin said the vicar had been a man with a lot of ideas. "He was trying to look at how the (church) building could be made fit for purpose for the 21st Century," he said. "He also had ideas within the community of trying to bring people together and bring more young families to the church." Parishioners Roger and Theresa Holliday said Mr Suddards had already started making a difference in the town. Mrs Holliday said: "There's the old folk and the traditional, and then there's the youngsters and the modern, and it's often very hard to get that together and he was doing it." Mr Holliday said: "He was going to do things for Thornbury and we will all suffer the loss." St Mary's Primary School head teacher Avril Muirhead said in a statement: "In the short time John had been with us he very quickly became a much loved and respected member of our school community." She said: "John was a very kind and caring man and was always available to myself and other members of staff when we needed calm counsel and a listening ear and he will be greatly missed by us all." Mr Suddards was also fondly remembered by former colleagues in Essex. The Bishop of Colchester, the Right Reverend Christopher Morgan, said he had been "very keen to be out and about" and was well known in the town. He said: "He had a good twinkle in his eye and a ready sense of humour. I'll remember that crooked smile of his and you'd wonder what was coming next. "He was a person of learning but he carried that very lightly and he was a great colleague." Phil Barlow, a former mayor of Witham, said: "He was a family friend and was always very people-oriented. 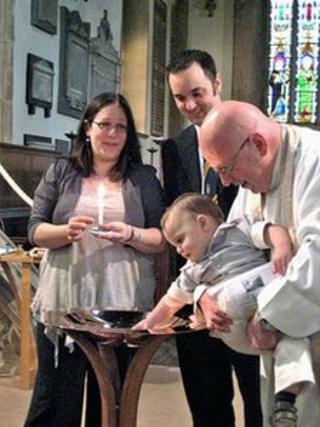 "Although he had a senior position in the church in Witham, his pastoral work is what people will remember him for. "He cared for people and supported them. He was always kind and compassionate."